While my digital-self has been quiet over the last few months, I have not been entirely inactive. 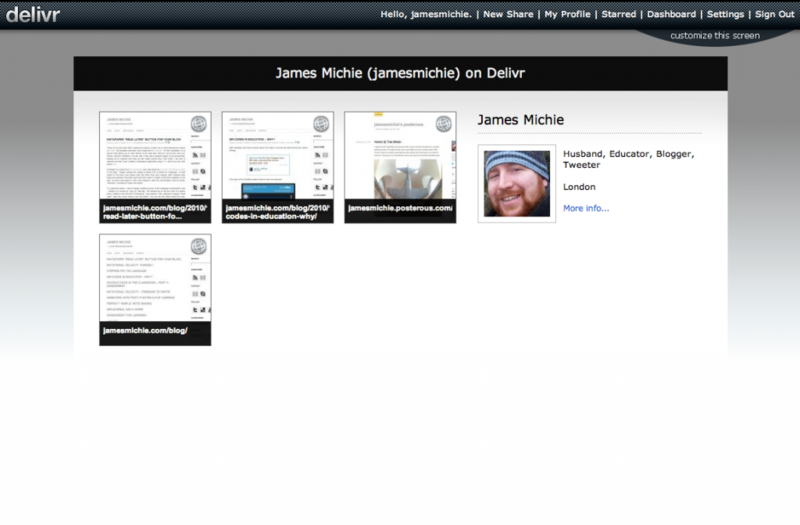 Having instigated a cleanup of my web footprint (I shared the initial stages in this post), I have continued this process alongside a number of subtle design/structural changes to jamesmichie.com and jamesmichie.com/blog. Also, I have made some changes to my online workflow – more out of necessity than choice. Following on from decreasing the number of peripheral accounts that I had. I set about redesigning my second blog. I added a more pleasing theme and retitled it ‘Et cetera’. I felt, that what was my other blog, lacked a clear sense of purpose. As such I’ve added the tag line: ‘…riffs, ramblings, snippets and pics’. These were not extensive changes but add clarity to the role this blog plays in my online presence. I also wanted to draw a bit more attention to ‘Et cetera’, so I added buttons to both jamesmichie.com and jamesmichie.com/blog. 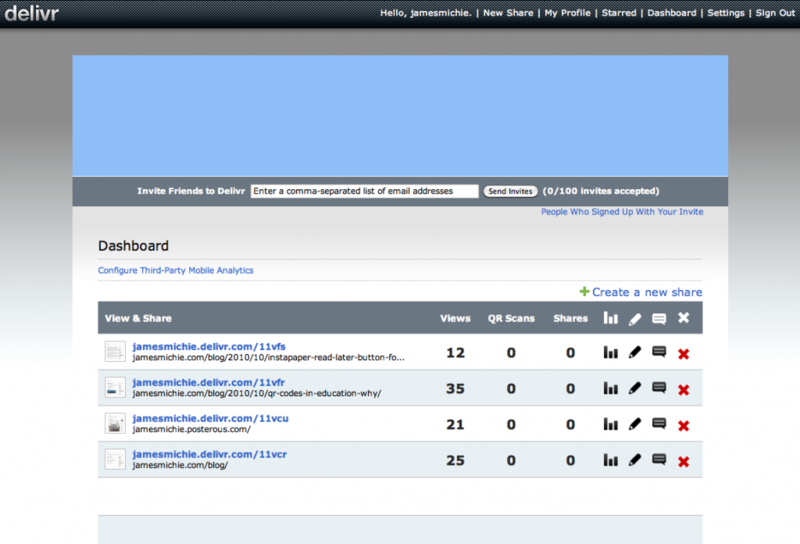 This coincided with the removal of the Facebook page I set up to promote jamesmichie.com/blog. The page added limited value and very few additional readers. This also resulted in the deletion of my Facebook account. The continued uncertainty surrounding Facebook’s inability to take its customers’ privacy seriously, have left me under no illusion that it is better to be out than in. 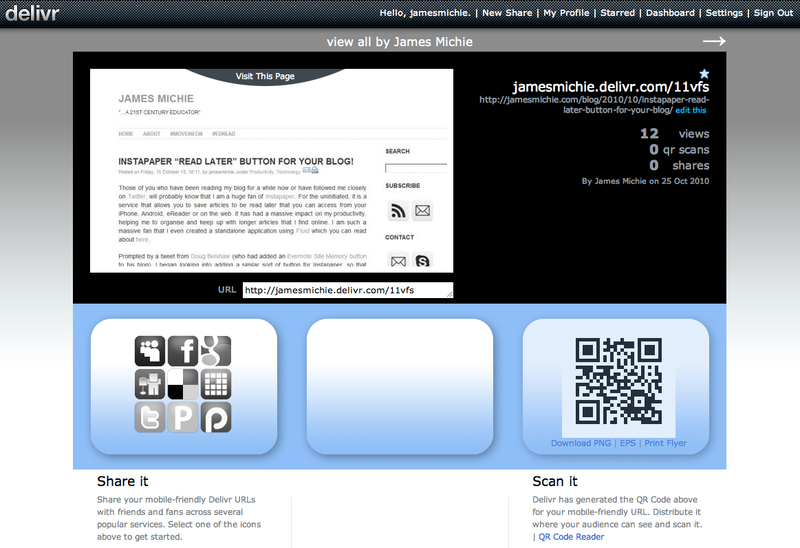 I have made some minor changes to jamesmichie.com including adding a ‘bookmarks’ feed. Likewise, I have added the same feed in the sidebar of this blog. This change was prompted by Google’s decision to remove the sharing functions within Google Reader. The result? Google Reader continues to be my RSS reader of choice, however I laboriously reviewed the items I had shared (automated to Twitter via ifttt) and added any that I wished to keep to my Delicious bookmarks. 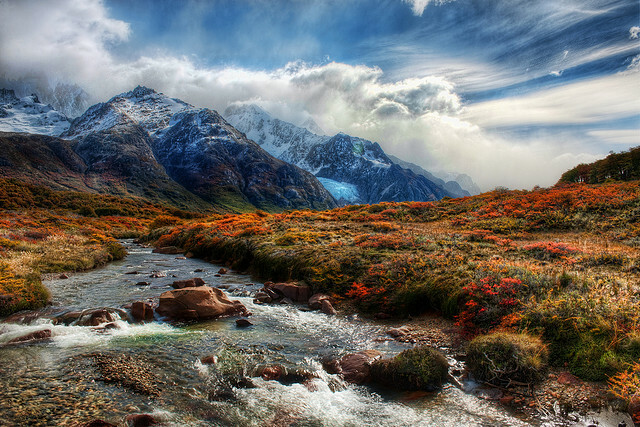 I am now using this to both bookmark and share items – again, automated with ifttt. Initially, I was annoyed about Google’s decision but this has actually helped in the slimming down of my web presence – streamlining my sharing/bookmarking workflow. What’s more, with the reduction of sources from which I am sharing information, I have removed the shared stream that was present on both jamesmichie,com and jamesmichie.com/blog. Also, I have made some subtle changes to this blog, including the addition of text snippets in the side bar to further encourage people to subscribe to the blog and to also promote conference and events, at which I will be attending/speaking. As I have taken each step, deleting accounts; cleaning up features; adapting my workflow, I have felt calmer, more in control, more focused. I can see that much of this has come as a result of the reading I have been doing this year – particularly the work of Leo Babauta. His books ‘The Power of Less‘ and ‘Focus‘ have had a profound effect in helping me to channel my energy into projects that matter. I am not, now, opposed to trying out new tools or apps. However, I think it is important to limit your output – the more outlets that you are having to keep up is a form of distraction in itself. Twitter NOT Facebook (sometimes Google+). Cloud App NOT Posterous, Twitpic, yFrog and Mobypicture. Each of these choices have helped me to streamline my web footprint, reduce friction, and find focus – allowing me to fully appreciate the value of ‘less’. Most of what we say and do is not essential. If you can eliminate it, you’ll have more time, and more tranquillity. Ask yourself at every moment, ‘Is this necessary? As Google Chrome comes of age (in beta at least) I have kicked Firefox to the kerb, an act that I thought may never happen, for 95% of my web experience. The only thing that is keeping the Fox in my life at all is the poor integration Chrome offers with Moodle which is my schools VLE of choice. More info on Chrome’s shortcomings with Moodle and how to get past them (unless you only run Apple products like me) can be found on “Changing The Game” a Moodle-oriented blog written by @iusher. I’m not going to dwell on Internet Explorer, Opera and Safari for very long. It’s a simple matter of security + usability + reputation that turned me into a Firefox user in the first place. IE as has been widely written about is simply not secure enough. On top of this it is a Microsoft product so is automatically put in the do not use pile for me. While I consider myself to be something of a geek, Opera is one step too far as Browser’s go; in much the same way as Linux is in terms of operating systems. What did surprise me was the fact that I didn’t turn to Safari as my browser of choice. Having started life as a Windows user Firefox came more naturally into my web based experience – or in other words the Fox did a better job of marketing itself. When I started using Firefox, its reputation was already well established as a stable and secure browser. Then “add-ons” were introduced there was no turning back. 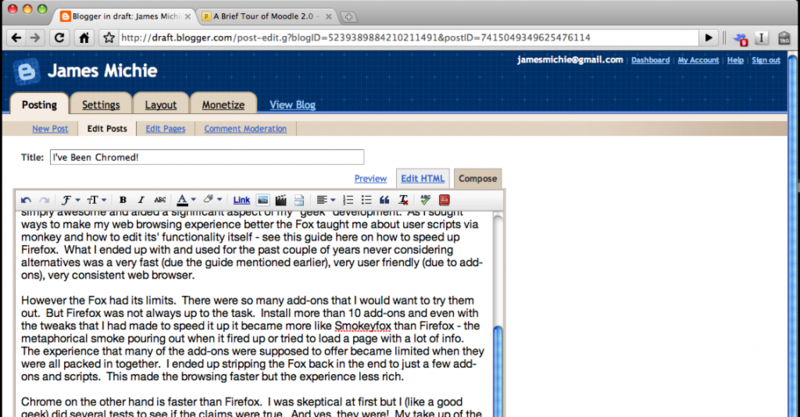 Firefox was simply awesome contributed significantly to my “geek” development. As I sought ways to make my web browsing experience better the Fox taught me about user scripts via Grease Monkey and how to edit its’ functionality itself. See this guide on how to speed up Firefox. What I ended up with and used for the past couple of years never considering alternatives was a very fast, very user friendly (due to add-ons), very consistent web browser. However the Fox had its limits. There were so many add-ons that I would want to try them all out. But Firefox was not always up to the task. Install more than 10 add-ons and even with the tweaks that I had made to speed it up it became more like “Smokeyfox” than Firefox – the metaphorical smoke pouring out when it fired up or tried to load a page with a lot of info. The experience that many of the add-ons were supposed to offer became limited when they were all packed in together. I ended up stripping Firefox back in the end to just a few add-ons and scripts. This made the browsing faster but the experience less rich. Chrome on the other hand is faster than Firefox even with “extensions” and scripts installed. I was sceptical at first but I (like a good geek) did several tests to see if the claims were true. And yes, they were! My take up of the browser was stalled though as functionality was limited in its initial release for Mac. Bookmark integration was not fully sorted and there were no extensions available. I bided my time and waited for the first stable release to really get to grips with it. I fell in love immediately because Chrome embraces the true aesthetics of Mac – clean simple design. Use Chrome for a few minutes and I fail to see how anyone could not like the simplicity of the interface, it is beautiful. Look closely at the picture above. What you see is what I want to see. I have a variety of scripts and extensions installed but many remain invisible working from within the browser itself. There is no need for clunky menus and the tab positioning and functionality is great. Chromed Bird, Instachrome and Delicious all use pop-out windows that float in front of the browser when you click on them. 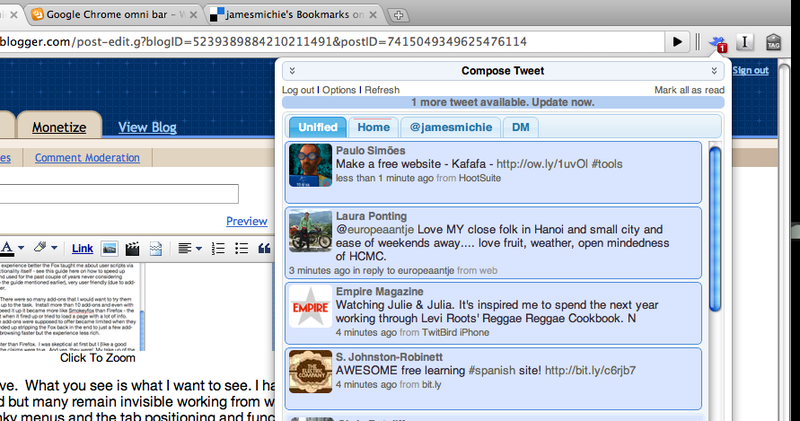 Finally, the Omni-bar is truly great – search, history and my delicious bookmarks are all integrated into one space. This makes the use of the browser so much smoother and cleaner. I am currently using the development channel, this enables me to not only use extensions but also to install scripts from sites such as Userscripts.org. Chrome extensions make the experience as rich as Firefox but they have almost no impact on operating speed. User scripts load directly in to Chrome without the need for an extension such as Grease Monkey. The installation process of all extra Chrome features is very smooth and there never a need to restart the browser. 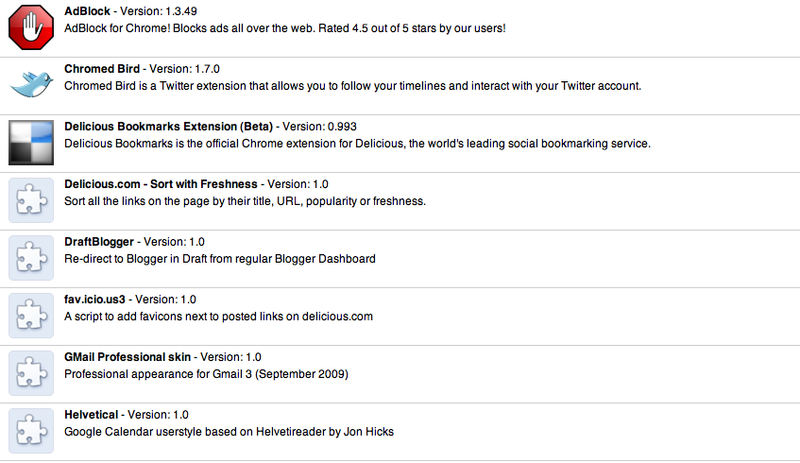 Below is a screen grab of just a few of the extensions/scripts that I have installed. Sites that I frequent load as fast with the extensions enabled as they do disabled, making the Chrome experience truly worthwhile. Whether a solution arrives through Chrome first or when Moodle 2.0 (Check out this brief tour here) is finally released I will kick Firefox to the kerb permanently. Until that day, the Fox will still play a small part in my life. It will not be long though and the time will have come to say “goodbye old friend”. 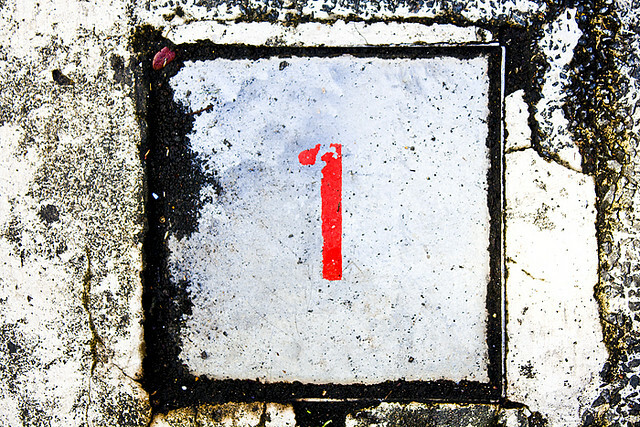 Posted on Sunday, 4 April 2010 Saturday, 19 November 2011 Categories TechnologyTags addons, browser, chrome, chromed bird, delicious, extensions, firefox, google, instachrome, omni-bar, user scripts2 Comments on I’ve Been Chromed!